It seems as though most people have already shared the gifts they made for Christmas LAST year. (I can’t believe we’ve already begun 2014!) I didn’t want to ruin any surprises before the holiday. Afterward, I got caught up trying to finish some projects/errands before the year ended. I am finally sharing some photos of the projects I made for family this year. My absolute favorite was a case for my mom’s new Kindle Fire. I used this tutorial, but with substituted measurements for the Kindle. Does it fit? I can’t really say. Unfortunately, I didn’t realize my mom bought herself the Kindle Fire Tablet instead of the normal-sized Kindle Fire. Hopefully this little guy can find a new purpose. Next up, my sister asked for potholders for Christmas. Between these and the Kindle case, I broke exactly 43 needles in just over a week. Time for a new machine! (I did try servicing my current machine to no avail. Thankfully, one of my gifts this year was a price match on the model I’m thinking of getting, a Janome.) But I think the potholders turned out okay. 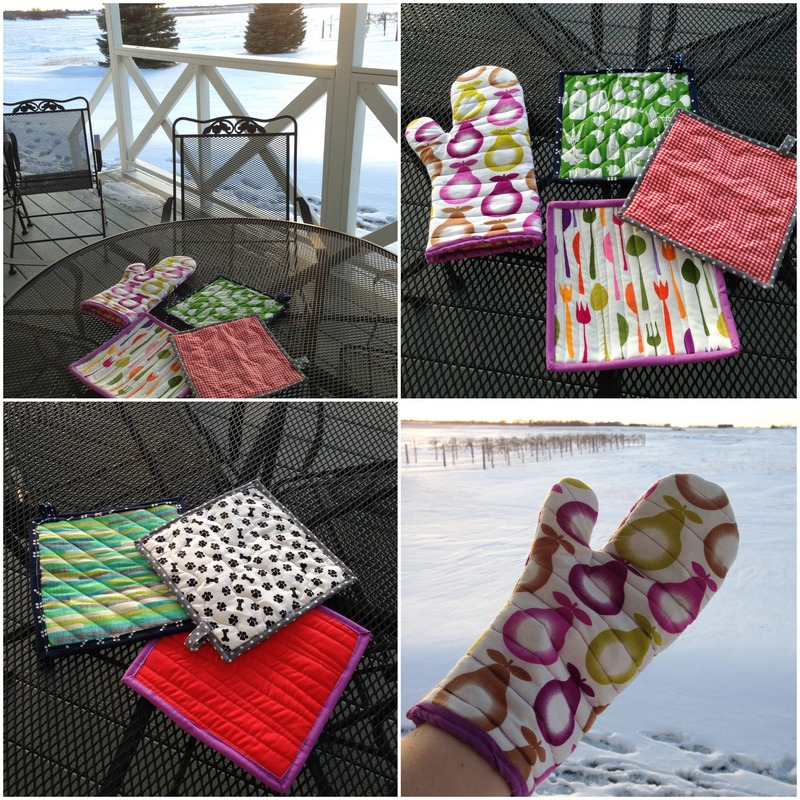 I used this tutorial for the oven mitt (except I quilted 9″ x 15″ rectangles, drew lines 1/4″ inside the pattern edges and sewed on the line, and then cut out the mitt shape 1/4″ outside the lines) and this one to add loops to the potholders, which were quilted 8″ x 8″ squares with one layer of batting and one of Insul Bright. I practiced machine binding all these items… with some challenges because of the continually breaking needles. My godmother asked for a breast cancer awareness magnet for her car. A series of errors caused me not to get the magnet, but I did make her a breast cancer awareness mug rug (free paper piecing quilt block pattern here) and a Starbucks You Are Here mug from D.C. for her mug collection. Sadly, I forgot to take a photo. I also made a gift for my dad. He’s the kind of guy who wore every ugly M&Ms tie we bought him for Father’s Day and proudly displayed our macaroni art. A cardboard “Buckle Up For Me” reminder I made him in third grade stayed in his Buick, sun faded, until he sold the car almost 15 years later. He’s exactly the kind of person who I thought would appreciate a homemade gift. I presented him with a tractor pillow for his camper. The back has cowboys, as his favorite shows include Gunsmoke and Rawhide. I found the fabric at a thrift store in Chicago (Unique Thrift) and knew I would someday incorporate it into a gift for my dad. 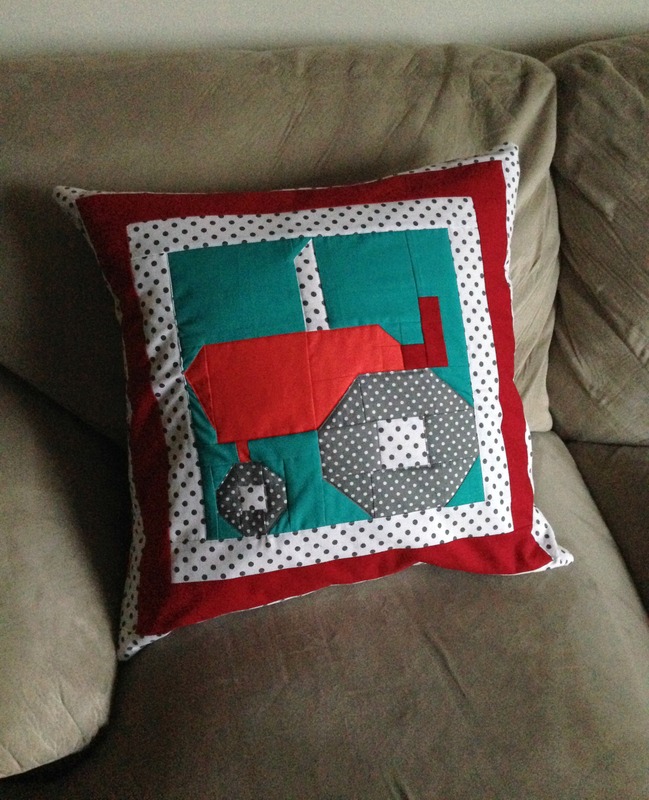 If you want to make a tractor pillow (or quilt block) of your own, I suggest using this tutorial, which my iPhone Google didn’t find (but my computer Google did–a few weeks too late!). 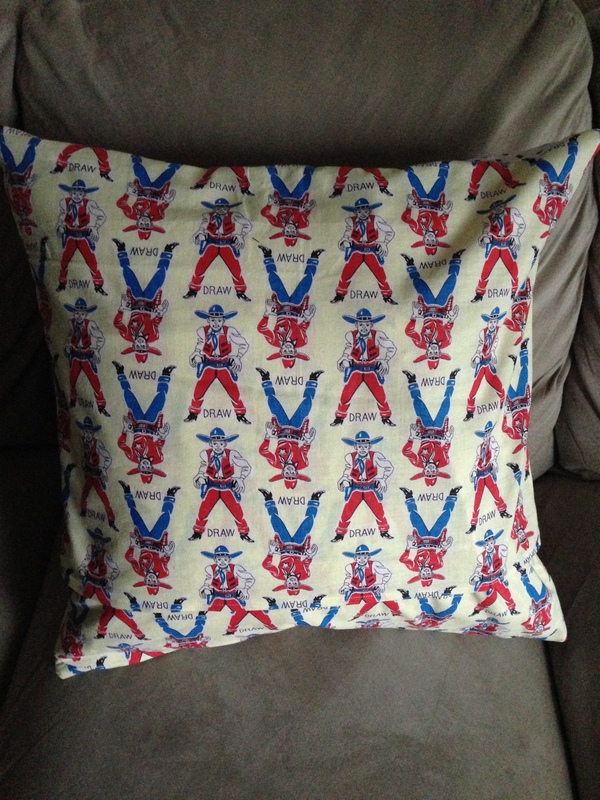 Otherwise, I’ll try to post the pattern I made for my dad’s pillow soon. Finally, a non-sewing gift I made for a friend was a version of The Nutcracker starring her two kids! Using an assortment of photos, I turned her kids into cartoons and included as many details from their home as possible: a shot of the house from outside, their real kitchen cabinets, their sofa, etc. The kids’ great-grandpa also starred in the book (instead of the uncle, it was Great Otata who brings the Nutcracker as a gift). 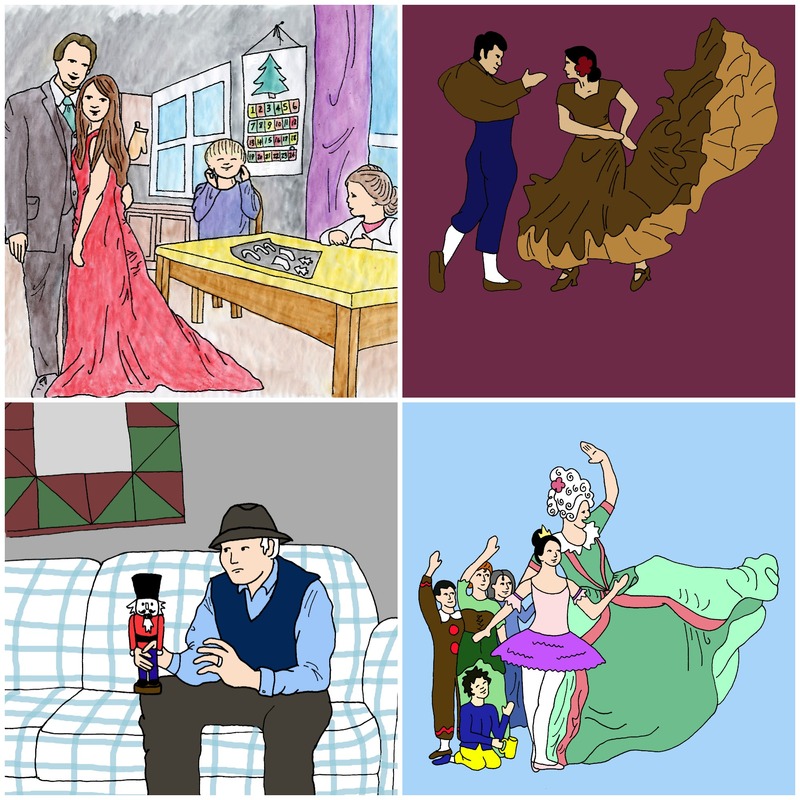 Below are some of the in-progress illustrations. I took advantage of holiday sales to have the final version printed via Shutterfly. Note: The pages were cropped down in Shutterfly, which meant the wonky edges were all edited out. Text was also added over the images where you see blank space. I am seeing a lot of resolutions for the new year on Instagram, and I am pleasantly surprised that most other quilters/sewers are posting about 4-5 projects each. Sometimes I feel like I am the slowest finisher EVER! Knowing that other people have a similar number of creative goals for the year makes me happy… even if it’s not a good idea to compare. Thanks to slow progress in 2013 (a project begun in July), I almost have my first finish of 2014! I’ll post when it’s done. For now, I just wanted to focus on the great creative start to a new year. Categories: Crafts & Projects, Other Sewing | Tags: boy doll, breast cancer, cancer awareness, cancer awareness ribbon, cancer ribbon free quilt block, cancer ribbon quilt block, Christmas, creative, cushion, d.c., gift, gifts, handmade, handmade doll, handmade gift, handmade gifts, holiday, homemade, homemade gift, homemade gifts, illustration, ipad case, ipad case free tutorial, ipad case tutorial, kindle, kindle case free tutorial, kindle fire, kindle fire case, kindle fire case free tutorial, kindle fire pouch, kindle pouch free tutorial, lumberjack doll, mug rug, new year, new year resolutions, new year's, new year's resolutions, oven mitt, oven mitt free tutorial, pattern, personalized story, pillow, pot holders, potholder, potholders free tutorial, resolution, sewing, sewing machine, shutterfly, starbucks, starbucks you are here collection, the nutcracker, the nutcracker ballet, tractor pillow, tractor quilt block, tutorial, washington, you are here | Permalink. Isn’t it so lovely when family love and appreciate handmade! I bet your dad was thrilled with that awesome cushion! 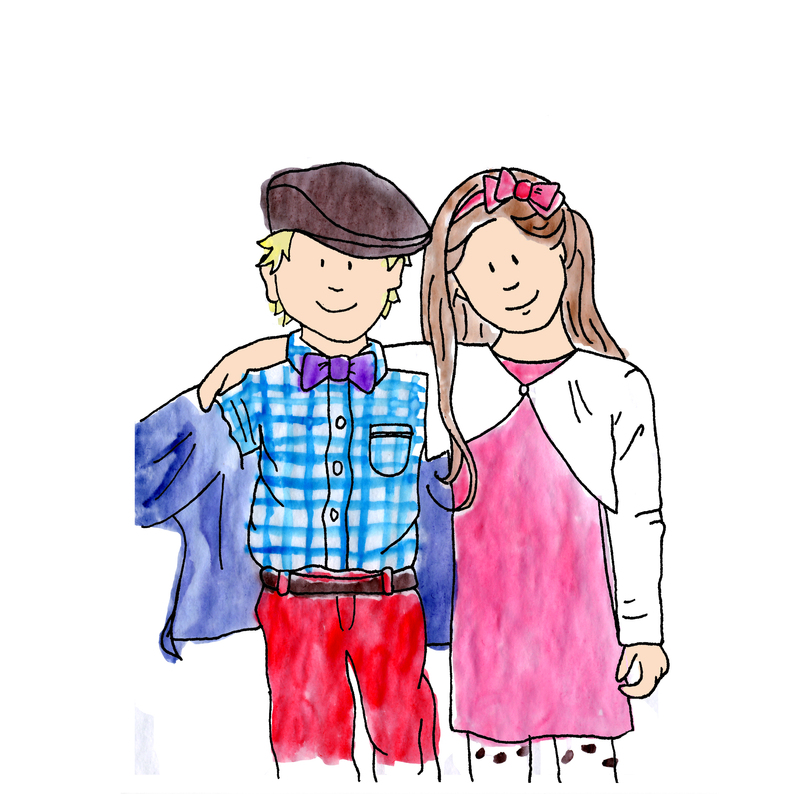 Your illustrations are just fantastic – what a beautiful and very thoughtful gift! !